They seemed to gravitate toward the used coffee grounds I had dumped in a couple of weeks ago. Are they larvae of some sort? caterpillars? Any ideas? Whatever they are, I really appreciate their munching away on those UCG's! Some kind of decomposer. If I let too many table scraps accumulate near the top of the pile, mine gets loaded with the same critter. Have never figured out what the adult is, though have not been bothered by any large pest, in spite of having what appeared to be hundreds of them in the compost at one time or another. I wouldn't worry about it, but if bothered, just make sure that you turn any of the fresh greens, especially table scraps, under agood layer of browns and turn it pretty regularly. Thanks... I figured I hadn't mixed in the used coffee grounds sufficiently, so I definitely gave it a good turning/aeration, and they didn't bother me in the least; I was happy to see them working so hard for me! But, it's good to know they won't hatch into some frightful invasive creature or anything. I find it strange that I've never knowingly seen the adult of these larvae. There were hundreds or thousands in my compost pile a couple of years ago. Would have expected droves of some kind of flying, biting insect. But never saw a single adult bug that I associated with the nasty looking critters in the composting slop. I thought they were fly larvae....have the same thing in my compost pile. I first noticed them a few days after I saw maggots - so I assumed they were fly larvae. I think I found your larvae. I think that they are crane fly larvae. It's not the black soldier fly we have. A lot of larvae but not many flies. They are good things and the larvae can do a lot of reduction. Sounds like they are not bad guys as long as they stay in your compost pile and they adult crane flies mostly either eat only nectar or they don't eat at all, just mate and die... Pretty harmless. Great detective work, Kimbledawn! That's got to be it... we do have crane flies here and there around here so that would make sense. Thank you! and thanks to everyone else who replied! 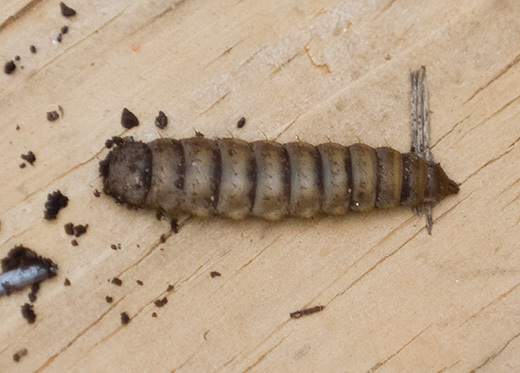 Beneficial Stage(s): Larvae feed on decaying-organic matter and assist in the biological decomposition process. Crane fly adults only live for a couple of days and do not usually feed. They sure were creepy-looking swarming en masse like they were today (it was like witnessing a decomposing dead body ), but I'm definitely glad they're in there! Thanks again to kimbledawn for identifying them! In other exciting newbie composting news , the other thing that happened when I was turning the compost today was that, finally, after several weeks of composting, the part underneath was warm and steaming!!! It was my first time seeing that and I wasn't quite sure my compost pile would ever get to that point!! Worms, writhing larvae, steaming piles... I never would have thought several years ago that these things would be so exciting to me! I am so happy for you. I was turning my compost today and before I knew it, I let out a loud whoop because I finally saw a worm. I feel so accomplished, and the worms and bacteria are doing all the work! Last night, while turning my compost bin, I found 10s of these guys. I figured, woo-hoo! Worms. But, then, I was concerned they might be BAD worms since I was trying to bacterial compost and had heard that the temperatures for bacterial composting should be intolerable for worms. I'm happy to learn that I may be an inadvertent larvae-composter, but at least the adult is not going to eat my plants! Thanks *very* much for this post. It saved me much stress and is the reason I joined the forum. Ooh, so exciting to find your first worms!! I still get excited when I dig into my formerly-infertile soil and uncover beautiful worms! techlawgardener, glad this post and kimbledawn's larva ID helped! I think http://en.wikipedia.org/wiki/Crane_fly this is it. Thanks for the info about this larvae..I've notice the larvae in my compost tumbler and thought something was wrong with my compost. Good to know that these little fellas are a good thing. My compost bin is in full sun..is that a problem?